In order to follow the development of the scout cruiser design we now have to go back to June 1922 when Hiraga was promoted to the rank of rear admiral and sent abroad the following year. The oversees assignment was nothing else than an attempt to get rid of Hiraga who at that time was in conflict with members of the Navy General Staff. When Kikuo Fujimoto took over as the chief designer, Hiraga’s absence was used in an unprecedented way to introduce changes to his design. Gunreibu exerted pressure on Fujimoto to include twin 20 cm gun turrets in the design of the four 7,500 ton cruisers. Since the construction of the first two ships – Furutaka and Kako had already reached an advance stage, it was too late to incorporate those changes into the design. However, the remaining two ships could be modified, so Fujimoto complied with the Navy General Staff demand and altered the Kinugasa and Aoba designs to include the twin gun turrets. The ships were outfitted with three twin-gun armored turrets, two in the forward section of the ship and one aft. The anti-aircraft artillery now included four 12 cm L/45 guns in place of the original 8 cm weapons. The guns were placed amidships, on each side of the ship. The plans also included aircraft facilities complete with a 27 m catapult. A 10 m catapult section was to be placed on top of turret No. 4 and the remaining 17 m section was mounted behind a smoke stack and in front of turret No. 4. The catapult design was later changed in the Aoba and Kinugasa plans: the original unit had several drawbacks that needed to be eliminated, so it was replaced by a 19 m catapult. As a consequence of this modification the aft section of the bridge and the smoke stack on both vessels were redesigned. Finally the catapult was placed aft of the stern superstructure in front of turret No. 3. Both vessels were to carry a single Nakajima E4N2 seaplane. Both ships were designed as cruisers with the normal displacement exceeding 7,000 tons and were officially classified as first class cruisers (itto junyokan), although the “A Class” classification (ko-kyű junyokan) was also commonly used. Aoba’s construction as No. 4 cruiser was officially authorized in March 1923. The order for the ship’s construction was placed in June 1923 and the cruiser was laid down on February 4, 1924. On September 25, 1926 Aoba was launched off slipway No. 2 at Nagasaki Shipbuilding and Engineering Co. The ship took her name from mount Aoba in Miyagi Prefecture. The official naming ceremony took place on September 18, 1923. The hulls of the cruisers had a high length-to-beam ratio (11.72 m). The ships’ high bow line and freeboard along with the slim hull lines were expected to produce high top speeds in the Pacific waters. The design requirements of the cruisers demanded a high degree of flooding resistance which was to be achieved through the use of armored citadel and a sophisticated arrangement of watertight compartments below the waterline. The hull measured 185.166 m in length and had a maximum beam of 16.506 m. It was internally subdivided by transverse and longitudinal bulkheads into watertight compartments. To maintain internal rigidity of the hull structure extensive riveting was used in its construction with only a limited use of welding. The bulkheads were irregularly spaced throughout the hull and the exact distances between them is shown in Table 1. Most of the hull structure was manufactured from HT steel, except main armor belt, middle deck and smoke stack armor plating above the middle deck, which were all made of NVNC steel. Individual structural members, including shell plating, frames, longitudinals, bottom plating, decks and bulkheads were made of HT steel of varying thickness – from 14 to 27.5 mm. The steel plates were mostly joined by rivets. Welding was limited to a minimum and only in certain parts of the hull to maintain the overall rigidity of the ship. The hull was divided into the following compartments: the bow section housed the crew quarters and the officer and NCO mess areas, corridors and magazines. Below them, on the lower deck level, were ammunition magazines No. 1 and 2 serving main gun turrets No. 1 and 2 and 12 cm AA gun positions. Behind them, in an armored citadel, there were 7 boiler room compartments and four main engine rooms. Ammunition magazines No. 3 and 4 were located in the after section of the hull. Storage magazines and the steering gear rooms could be found in the same area, with additional crew quarters located above them. The exact dimension and displacement data is shown in Tables 1 and 2. The armor above the waterline was supposed to protect the cruiser against 20 cm (8”) shells, although it never loved up to the expectations. The limitation imposed on the vessel’s displacement necessitated the use of thinner armor plates and reduced their use to only the most critical elements of the ship. The cruiser’s main armor belt was 79.88 m long and 4.12 wide. It ran from frame No. 105 to 241. The belt was made of 76 mm NVNC steel segments. The armor was attached to longitudinal No. 7 and was sloped at a 9 degree angle in relation to the middle deck. It protruded above the design waterline by 3.277 m. The middle deck in the engine room area was manufactured from 35 mm NVNC steel plates. The smoke stack uptakes were protected by 38 mm NVNC steel plates reaching up to about 1.28 m above the middle deck level. Additional upper deck armor protection was provided in the form of HT plates of varying thickness – from 19 to 48 mm. The walls of forward and aft magazines were covered with 51 mm NVNC plates and the floors and roofs were made of 35 mm NVNC plates. The conning tower lacked armor protection, only the steering room was covered with 12.7 – 25 mm steel plates. Armor protection below the waterline was limited to the fuel bulges just below the main armor belt. That design feature ruled out the use of thicker armor. Aoba’s powerplant consisted of four Mitsubishi-Parsons turbine assemblies delivering a total of 102,000 SHP. A single turbine set consisted of an impulse high pressure turbine rated at 12,500 SHP and a 13,000 SHP low pressure turbine connected via a gear reduction mechanism. The reduction gear reduced the high pressure turbine speed (3,000 rpm) and the low pressure turbine speed (2,000 rpm) to 360 rpm for each shaft and propeller arrangement. An astern turbine was incorporated in each low pressure turbine and had a rated power of 7,000 SHP (for a total power of 28,000 SHP). The ship’s powerplant was divided into four separate assemblies, each driving a shaft-propeller combination. Under combat conditions each assembly could operate independently from the other ones. The steam, pressurized to 18.3 kg/ cm2 and superheated to 156°C was delivered by 12 Kanpon “RO GO” boilers. Ten of those were oil-firing units, while two used oil or coal as fuel. The boilers were mounted in seven boiler rooms: to medium oil-firing boilers were installed in boiler room No.1, followed by 8 large boilers in four boiler rooms and a single boiler room housing two small alternative fuel units. Auxiliary powerplant consisted of four generators: two 90 kW and two 135 kW units, delivering a total of 450 kW of power. The generators were used to provide 225 V electrical power for the ship’s systems. The steering gear was powered by vertical steam engines, which powered hydraulic pumps used in the hydro-electric drive mechanisms. 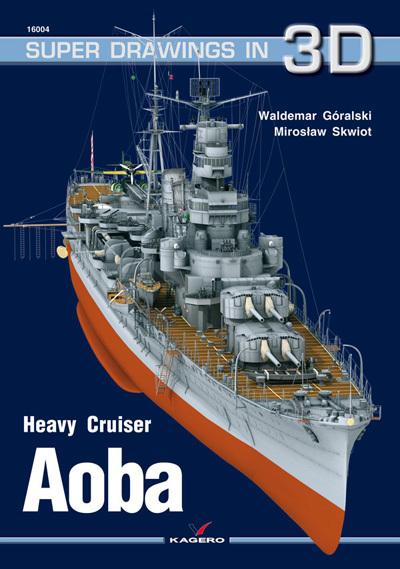 Aoba class cruisers carried 1,400 tons of oil and 400 tons of coal, which gave them the endurance of 7,000 nm at 14 knots. Lessons learned from operational use of smaller vessels such as light cruisers were applied in the design of the bridge structures of the scout cruisers. The bridge had to accommodate all vital systems dedicated to steering and fire control, as well as defense against the surface, submarine and air threats. Aoba’s bridge was divided into six levels. The top level housed a firing control platform (shageki shiki sho) with the main Type 4 Hoiban gun director. Below the firing control platform was the main target survey platform (sokuteki sho). Just in front of it and on each side there were three Sokutekiban Type 13 target speed and course calculators. The compass bridge (rashin kankyo) was located just below. When the ship was first completed the compass bridge area was unprotected and a roof was added later in the ship’s service. Two 3.5 meter rangefinders were mounted on the tower next to the compass bridge. The two lowest levels of the bridge included an upper bridge (jobu kanko) and a lower bridge (kabu kankyo). Among the compartments located within the bridge structure were storage areas for sea maps and navigation equipment, command post, captain’s mess and various magazines for day and night observation equipment used on the ship. As originally designed, the cruiser’s main armament was to consist of six main guns mounted in separate “A” Model turrets based on the smaller units housing 14 cm guns on the cruiser Yobari. As has been previously mentioned, Fujimoto was pressured by the Gunreibu to place the ship’s guns in new twin turrets. Engineer Hada adapted the turret designed earlier for the Myoko class vessels to be used on Aoba class cruisers. The adaptation work was completed in mid 1925 when the ship was still on the slipway, so all the necessary changes could be easily incorporated into the design. Eventually the cruiser was completed with the same number of guns as Furutaka with the six main 20 cm/L50 guns mounted in three twin “C” Model turrets. Two gun turrets were placed along the ship’s centerline in the bow section and were designated No. 1 and 2. No. 3 turret was mounted in the aft section of the ship. Medium HA (anti-aircraft) artillery included four Type 10 12 cm/L45 guns mounted in “B” Model turrets. Similarly to the main guns, the HA gun fit was also changed compared to the original design that was to include older 8 cm Type 3 guns. The HA guns were all mounted amidships and abreast the smoke stacks. Additionally, two Lewis 7.7 mm machine guns were mounted on the bridge structure. The torpedo armament included 12 Type 12 61 cm torpedo tubes grouped in six twin launcher assemblies and firing Type 8 torpedoes. In November 1938 Aoba was brought to Sasebo shipyard for modernization and reconstruction work. The project was completed on October 30, 1940 and resulted in some changes in the cruiser’s armament fit. The main artillery consisted of six Type 3 20 cm/L50 guns mounted in three twin “C” Model turrets. Medium artillery comprised 4 single Type 10 12 cm/L45 guns placed in single “B2” Model turrets. The ship was also equipped with four twin Type 96 25 mm AA cannons and two sets of twin Type 93 13 mm machine guns. Torpedo armament consisted of two quadruple Type 92 61 cm torpedo tubes protected by a Type 1 armor screen. The ship carried sixteen Type 90 torpedoes that were replaced in 1940 by Type 93 weapons. The gun was designed in 1924 by Chiyokichi Hada. In 1925 Hada also designed a single gun turret, but it was his 1926 twin gun turret design that was used on Furutaka and Aoba cruisers. Originally the turret was designed for Myoko class cruisers, but Cmdr. Fujimoto incorporated it into Aoba plans following the directives of the Navy General Staff. Cmdr. T. Fukuda was in charge of the weapon’s production at Kure and Mururoan, while Adm. K. Hidaka oversaw the manufacturing of gun turrets at Kure and Yokosuka. The guns were also installed on Amagi and Kaga aircraft carriers. According to the Report 0-47(N)-1 300 20 cm guns and 120 gun turrets were manufactured. The specifics of the weapon can be found in Table 3. 7 Length overall 1,031 cm (408 in) In early examples semi-wire wound. 8 Barrel design Later built-up. After reconstruction built-up with removable sleeve. 19 Illumination shell weight ? ?